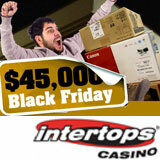 To help get the holiday shopping season started, Intertops Casino is giving away $45,000 in Black Friday Madness bonuses this month. Although the official beginning of the holiday shopping season isn’t until Thanksgiving, at Intertops the cash giveaways have already started and all players have to do to qualify is deposit and play. Three players will each receive $1000 in casino bonus money. Intertops Casino players earn points for bets placed and more points based on profits and losses. On November 29th, the three winners will be randomly selected from the 15 players with the most bonus points in November. A live scoreboard shows players where they currently stand. Hundreds more online casino players will win bonus cash just by playing any of Intertops’ hundreds of casino games. Twice a week individual bonuses of up to $250 will be awarded to randomly-drawn players based on their game-play performance. Players will be notified by email. For a little break from shopping madness, Intertops Casino has a special free game this month. Shopping Cart Hero is popular animated game where players speed down a steep hill in a shopping trolley and try to jump as far as possible off a ramp. Intertops Casino features more than 300 instant-play and download games including 3 and 5 reel slots, multi-hand video poker, and traditional casino favorites from 3-Card Rummy to Blackjack, Roulette and Keno. It hosts daily slots tournaments where players can play against other players on some of the site’s most popular slot machines such as Crystal Waters, Loose Caboose and Texan Tycoon. The daily Tournaments Schedule now also includes slots tournaments played on Enchanted Garden, Triple Twister, Goldbeard and Naughty or Nice. Intertops Casino players can use their Intertops account to place bets on American major league sports including NFL and NHL games. Intertops Sportsbook also gives players a chance to win a trip to the Super Bowl. A US-friendly online casino, Intertops is known as one of the most reliable and trustworthy online casinos in the world and has a reputation for quick, hassle-free deposits and withdrawals and excellence in customer service.